Excellent dual purpose variety, particularly for solid miniature heads when planted closely, or for a snow white larger head at wider spacing. 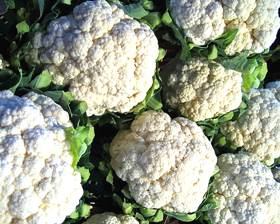 Cauliflower Summer Alfa has a vigorous, upright habit, producing quality heads which stand well in good condition. Suitable for close spacing to produce miniature heads. Sow seeds February to June or October overwintered in coldframes. Sow seeds in individual pots or a seedtray of good seed compost and cover with 6mm of compost or vermiculite, at a minimum of 15C, until germination which takes around 7 days. Alternatively, can be sown thinly in a prepared seedbed 13mm deep, allowing 30cm between rows.